The beauty of kiteboarding is that you’re never done improving. There is always something you’ll be working on and improving. In the beginning it’s kite control, standing up on the board, riding, and traveling up-wind. As you progress it becomes more about carving transitions and then, very quickly, jumping. 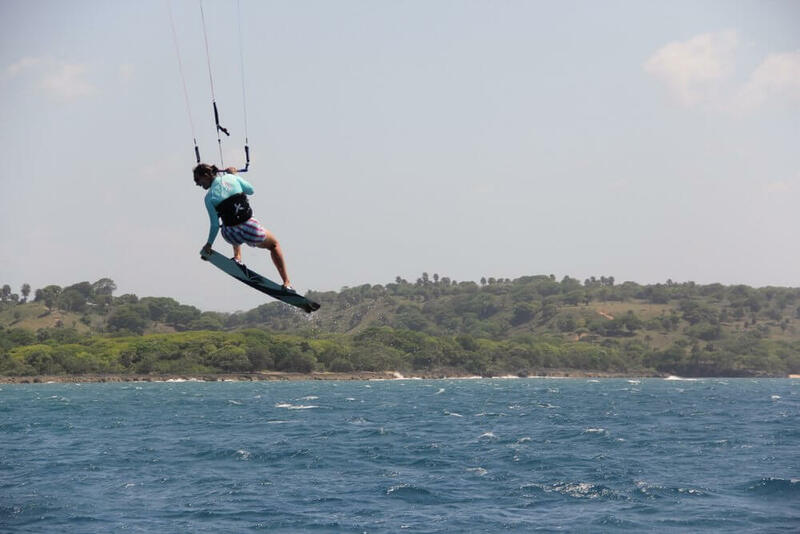 This article is all about teaching you to learn how to jump while kiteboarding. The sky’s the limit! Jumping is part of what makes kiteboarding so awesome. The kite produces two forces: drag (helping us glide across the ocean or snow) and lift (allowing us to take flight, on demand). 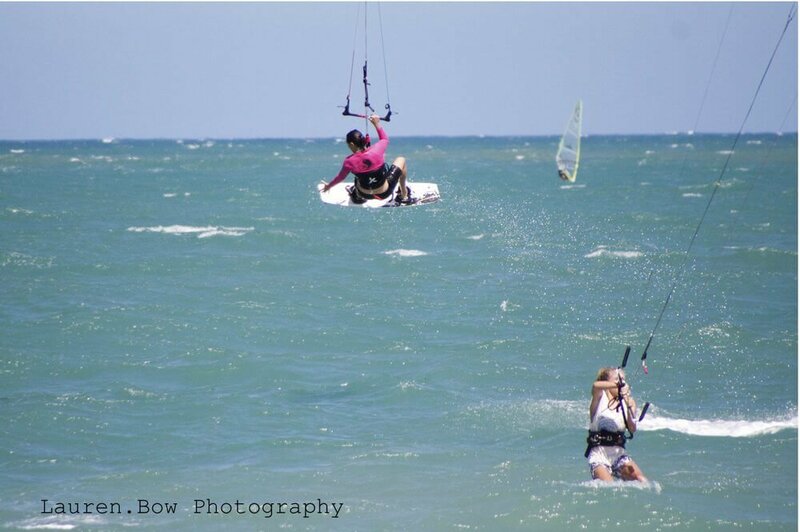 Jumping is massively fun and a huge reward for us as kiteboarding. The risk to reward ratio is low and it’s something available to all kiters! The key to staying safe and preventing big smashes is adopting the right learning progression. First: make sure your skill level is there to start jumping. You should be riding upwind, carving transitions without sinking, and steering your kite in the sky without looking at it. Start with the “chop-hop”: use your forward momentum and a small piece of chop or a little wave to lift off the surface and land back on the water. This teaches you basic fundamentals about take-off and landing. Next work on edging the board and pop. Check out this excellent video for step by step instructions. Once that’s dialed you can begin to use the kite for its magical power of lift. Be conservative at first with the kite movement. Start small. Jumping is all about timing. Having the proper kite and body position is also super important. The kite should move from pretty high, to above your head, to sweeping back down for your landing. Your body is edging hard, resisting the kite then when you release you push/jump with your legs. In the air, it’s good to keep your body squared up with your knees bent. When landing, point the board downwind and keep those knees soft to absorb the impact. Beyond just going out and jumping! jumping! jumping! Here are my specific recommendations on how to progress quickly and easily. Follow these steps and you’ll have a great time while you learn how to jump! It’s worthwhile to get an hour advanced lesson (ideally with a radio helmet) from a great instructor who can help guide you through the ever important timing. Here at our kiteboarding school in Cabarete, Dominican Republic we offer great radio-assisted advanced lessons for $48 per hour. Also, you can check out the incredible jumping kite we ride: the Ozone Edge. Come test it out here with us in Cabarete! If you don’t have an instructor handy at least ask a kiteboarding buddy to film you doing a couple jumps. Hopefully you have friends with whom you ride and might be better at jumping. Ask them to look at your video and give some tips. Repetition is key. You’ll need to try jumping a lot. Start each session with about 5-10 minutes of warm-up riding and then go to “work”. Set a number of jumps you’ll do on EACH TACK. Start low, like 3 jumps on each tack before you transition. As your endurance for jumping increases you’ll want to add more “minimum number of jumps” per tack. The basic idea is to get you away from just riding and really focused on improving. Jumping really works your core muscles, don’t worry if you’re sore…it’s good for us! Also, be patient. It takes time. Once you’re comfortable jumping (and landing) you’ll soon start to want to really fly. Boosting is an amazing feeling. You need to experience it! Three amazing high-tech solutions that can really help you progress and improve. If you want something to improve, you should track it, and that’s exactly what the WOO does. This little blue device attaches to your board and measures every single jump of your session. Tracking time, number of jumps, each jump height and hang-time makes it easy to see your progression. After each session it wirelessly pairs with an app on your phone, and you can upload the session to your profile. One day you’ll be making it on to the regional and maybe even the global leaderboard! The WOO is $199 and you can demo it for free right here at LEK. Nothing is more enlightening than seeing yourself perform. Asking family members and friends to film you gets old pretty quickly. That’s where the robotic cameraman comes in! This nifty product was actually developed right here in Cabarete. The 3rd version has a built in camera and offers automatic editing. You can pre-order your SOLOSHOT3 for $599 and this summer you’ll be set up for incredible progression. Check out this great app developed by my friend, professional kiteboarder Jeremy Lund. Those video clips I told you to get earlier on? Send them to Jeremy and he’ll provide specific coaching. For a taste of his great coaching, check out this video where he’ll teach you to boost higher. So there you have it! Now it’s a matter of getting out on the water and making it happen. With a little time and dedication you’ll be well on your way to learn how to jump kiteboarding. I would love to hear from you in the comments section. What’s worked for you? What’s holding you back? Do you have questions about your gear or the tech I’m recommending? Let me know how I can help you more and most of all have fun learning the art of flight with the kite!